May be used in water or fuel systems to keep pumps primed and to prevent back-flow in pressure systems. Unique design reduces flow turbulence and restriction, and improves pump performance. Cast bronze construction. 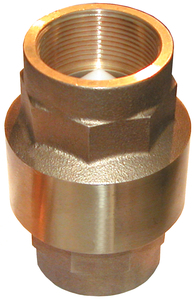 NPT threaded ports.